We come together this afternoon to commemorate one of the most intriguing figures in our history, the Cardinal Duke of York, and to pray for the repose of his soul according to the traditional rites of the Church. 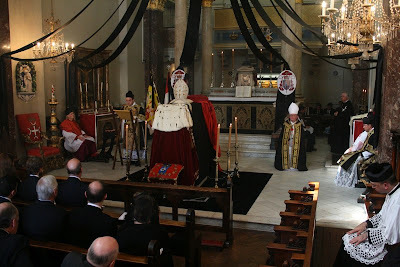 It might seem at first rather strange that this Requiem is being held in London, for the Cardinal Duke spent almost all his life in the Papal States. Indeed, the closest he got to setting foot on British territory was his evacuation to Sicily in 1798 aboard Nelson’s flagship, HMS Vanguard. In this country he is largely forgotten; but his memory is still kept alive in and around the Eternal City. His monument stands proudly at the back of St Peter’s Basilica. His coat of arms can be found in Santa Maria in Trastevere and elsewhere. The prayers for the Conversion of England which he and his father introduced to the church of Santa Maria in Campitelli, were still in use until recently. Throughout the Castelli region, just outside Rome, there are numerous plaques in churches and on streets witnessing to his patronage – a church he dedicated here, a school or orphanage he opened there. And yet, despite his apparent foreignness, the Cardinal clearly belongs to our nation’s story, as grandson of James II and, for nearly twenty years, the senior member of the Royal House of Stuart, known to his supporters as King Henry IX. If he had emerged victorious from the Venetian Conclave of 1800 – and as a senior cardinal he was considered in some quarters to be papabile – then he could have uniquely claimed to be Supreme Pontiff and King of Great Britain. One of the most impressive aspects of Henry’s character was his dedication as Cardinal Bishop of Frascati for over forty years. He lived a lifestyle according to his high rank, as he was expected to, with an especial fondness for music, feasting and fast horses, but this clearly did not distract him from his Episcopal duties. He re-founded the Frascati seminary, established a magnificent library, organised two diocesan synods and became known as the ‘Protector of the Poor’. The only work of his to be published in English, thanks to the Catholic Truth Society many years after his death, was a pamphlet entitled The Sins of the Drunkard. Of that prettily-situated city, successor of Tusculum, from which the bishop yet derives his title, the Cardinal is still considered the great benefactor. Whatever else may have been wanting for his title, to a royal heart he was no pretender. His charities were without bounds; poverty and distress were unknown in his see…The diocese of Frascati was full, when the author first knew it, of recollections of that Cardinal Duke, all demonstrative of his singular goodness and simplicity of character. During this Bicentenary Year of his death, we especially remember the ‘simplicity of character’ that marked his final years. He celebrated his own accession after his brother’s death in 1788 by striking medals with the famous words ‘not accepted by men but chosen by the will of God’. He continued the royal custom of touching for the ‘King’s Evil’ and was addressed as ‘Majesty’ by his household. And yet he promoted his claims with discretion and a touch of realism. His biographer, Herbert Vaughan (not to be confused with the Cardinal of the same name) suggested that ‘in his own eyes he became, after his brother’s death, King of Britain in Rome, and no further recognition did he desire or demand’, being content to pray for the Conversion of England and ‘place himself and his cause in the hands of the Almighty to deal with as He thought fit’. Not accepted by men but chosen by - and obedient to - the will of God, whatever that might involve. Already at his accession, the storm-clouds of revolution loomed. During the wars of the 1790s the Cardinal lost most of his revenues and was forced to flee his beloved Frascati. It was at this moment that he received an annual pension from his third cousin twice removed, King George III – a sign of the cooling of old resentments in the face of a new radicalism. The venerable Cardinal was seen no longer as a threat but rather an object of compassion and a symbol, perhaps, of a nobler era. Despite the close proximity of the Napoloeonic Wars, the Cardinal’s final years were relatively peaceful. The new Pope had returned to Rome and the Cardinal Duke was now Dean of the Sacred College and, therefore, Bishop of Ostia and Velletri. However, he was allowed to continue residing at Frascati, enjoying the companionship of his loyal supporters and even a King Charles Spaniel, who had attached itself to the Cardinal at St Peter’s – a sure sign, in the old man’s eyes, of the dignity of his Stuart blood. The venerable Cardinal finally died on 13 July 1807, the forty-sixth anniversary of his translation as bishop to Frascati, and his royal claims were passed on to his second cousin, Charles Emmanuel of Savoy – another religious man, who ended his days in a Jesuit novitiate in Rome. 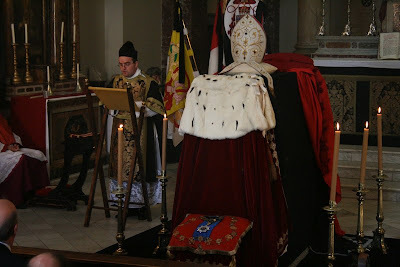 So, we pray today for the repose of the soul of the Cardinal Duke of York – not merely a historical might-have-been but a conscientious pastor and, in the words of the somewhat florid homilist at his original Requiem, the ‘last and sublimest glory of the House of Stuart’. 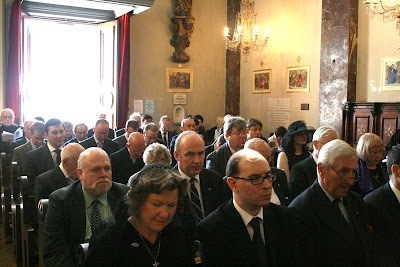 We remember also the other members of his family – in particular his father, brother and saintly mother, all of whom are buried in St Peter’s, waiting for the last trumpet to sound. 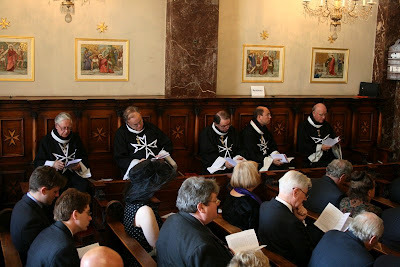 Through the offering of the Sacrifice of the Mass and the Prayers of Absolution which we are about to say, we ask the Lord of consolation that, though the last Stuarts did not inherit their Kingdom in this world, they will receive the crown of the blessed in the Kingdom of Heaven – a Kingdom to which we all aspire and to which we are true heirs. I was going to say in my previous comment that I would very much like to have read your panegyric. Many thanks for posting the text. I was reading a book on the life of the Cardinal Duke of York some years ago. Was it Vaughan's biography ? I can't remember. I must see what books the Royal Stuart Society recommends. I do remember reading that as Cardinal-Bishop of Frascati (where he held court) he was pastorally quite involved with his suburbicarian see. I think I remember reading he had been requested not to display prominently his arms coram publico, because they included the arms of England, Scotland and Ireland, with the closed crown of monarchy, while the papacy had recognised the legitimacy of the house of Hanover in, I think, 1766. A strange historical situation, and a rather poignant end to the royal house of Stuart. I have now been able to link to the fine photos of Vernon Quaintance which really convey the atmosphere of the event. I must say I think Bishop Longley was rather brave, if I can put it that way, to go through the rather complex rubrics required. Perhaps we may yet see a more public Pontifical Mass in the "old" use, as has happened in other countries. From the sacred to the profane, I thought I spotted other glasses at the reception. Unless the champagne flute was not used excusively, there must have been other, er, refreshment available. When, as a young man, I lived in Italy, I would occasionally raise a glass of Frascati to to the memory of "the king over the water". Again, many thanks for your fascinating post. The whole event seems to have been meticulously organised. Congratulations. I read your panegeryc with delectation. It inspired me to recall the cardinal-duke to my french visitors. Father: Thanks to YOUR book with Father Skinner, I found your entries on the Mass for His (late) Eminence the Cardinal Duke of York most fascinating. Thank you for teaching me something about our Catholic history. Calais was certainly the closest he got to England in a geographical sense, and had the '45 turned out differently he might actually have crossed the Channel. But the closest he got to actually setting foot on British territory was his journey on-board a ship of the Royal Navy.